Minority caucus council members speak in support of embattled Director of Schools Dr. Shawn Joseph. 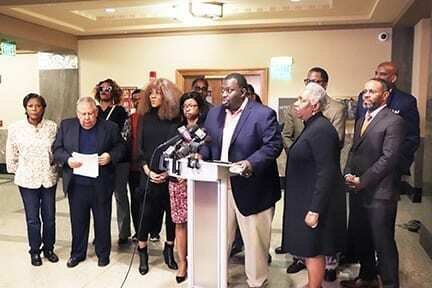 NASHVILLE, TN — On Tuesday at noon members of the Minority Caucus of the City Council met outside their offices at City Hall to express their outrage at the latest hostilities directed towards Director of Schools Dr. Shawn Joseph. “I wish we were bringing you better tidings today but it seems that in Nashville we still do not want to address the achievement gaps in our schools,” said District 5 Councilman Scott Davis. Davis said the school board had put stumbling blocks in front of Joseph who is dedicated to improving the lives of Nashville schoolchildren and he accused the board of sabotaging Joseph’s leadership of MNPS whose students are 70 percent black or brown. “We will not let the children of Metro schools be treated this way and have their leaders thrown out like some garbage like they’re trying to do. We are not going to allow this and I’m asking community members to write letters and call school board members,” Davis said. On Monday, one of Joseph’s allies on the School Board, Will Pinkston, announced he would be resigning effective mid-April. In a letter he sent to school board chairwoman Sharon Gentry, Pinkston said the board was dysfunctional. He said the anti-Joseph faction on the board was being irresponsible for pushing for a 10 percent pay increase for teachers when other city employees are going to get just a 3 percent COLA increase. At least four members of the nine-member board want to terminate Joseph’s 4-year contract that runs until June 30, 2020. Joseph announced Monday he would not be seeking to renew his contract but intends to finish it or come to some agreement with the board about his departure before then. Joseph said he would not resign. If he is fired for cause he would lose $285,000 of salary. At Large Councilwoman Sharon Hurt noted that Joseph’s children attend Metro schools and that attacks on him by the school board are surely taking their toll. “Why assassinate his character? Why try to destroy him professionally when he is lauded nationwide by other school systems for great academic accomplishments, and achievements he has made in this one, are we not concerned about our children?” asked Hurt. She added that the caucus would have an “extremely difficult” time supporting a budget for a school system that is “obviously culturally insensitive” and called for an immediate meeting with the mayor to try and find the next best course of action. 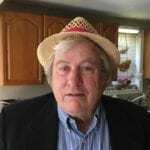 “My name is Ed Kendall. During my tenure on the board I work with at least six other directors I saw many of them do the same kinds of things the doctor Jose is being accused of,” Kendall said. Kendall spent 27 years on the school board before becoming District 21 Councilman. He said in the past the school board worked with past administrations to correct problems but members of the current school board intentionally wanted Joseph to fail. Past directors were all white, Joseph is the first black Director of Schools in Metro history. Kendall said Joseph’s big mistake was to try and fix disparities and close the achievement gap in Metro schools. He said MNPS needs a school board that would work with Joseph, not against him. “I would ask school board members to step back, rethink change in policy, ask for adequate resources, and give the man a damn chance,” Kendall said. “At best the school board has been dysfunctional for the last decade,” said District 28 Councilwoman Tanaka Vercher. She said Joseph inherited a huge challenge with high expectations and he made significant progress with minimal resources. Vercher noted the school budget was cut by $15 million last year but English proficiency scores have risen and more students are in dual enrollment programs than ever before. District 3 Councilwoman Brenda Haywood said she was thrilled when the District hired Dr. Joseph was hired two years ago. “This is a young man of overt intellect, of professionalism, dignity of character, somebody that we can be proud of,” Haywood said. “But in the eyes of many that’s not enough. I think this has to do with overt racism,” she said. Although each speaker addressed different things about the very public flogging of Metro’s first black Director of Schools, they all expressed their support for Joseph and their held resentment against the school board which they universally condemned.